What makes Kelly Hall unique? "Kelly is the only dorm with straight floors. You can look out your door and see straight down the hall to the other end of the dorm. There are no corners or turns. Also, it is located right on top of North Side Dining Terrace, so we only have to walk a couple of feet to get food." What is your favorite part about Kelly Hall? "Ms. B is the best thing about Kelly Hall. She is the funniest and most high-spirited person. Whenever she is on duty, she makes my night." What is your least favorite part about Kelly Hall? "I live on the first floor facing 34th Street so my view from the window is very bad. I have to look at the top of the air conditioner." "It only has three floors and does not have any elevators. The fact that the hallways are coed and there are all of the learning communities makes Myers Hall unique." What is your favorite thing about Myers? "It's small and has a homey feel to it compared to other dorms. And I like how it has the middle courtyard." What is your least favorite thing about Myers? "There are no elevators that we can use." "Millennium Hall is unique because of its layout, like the way the bathrooms are and because of the honors kids. Also, I feel its unique because I'm super close with every one on the floor and I feel like its like that for every one on my floor. Plus, everything is brand new and nice!" What is your favorite thing about Millennium? "My favorite thing would have to be the layout because it's so conducive for being social. I can hangout basically ANYWHERE, its awesome." What is your least favorite thing about Millennium? "I don't like how we cannot control our individual heating and AC. And also I hate how the elevators are broken all the time." "The building has the shape of an arch." What is the best thing about Calhoun? "The floors are coed and the living community." What is the worst thing about Calhoun? "The condition of the dorm." "Race is unique because it's the only freshman dorm that lets you live in a suite-styling living space. It offers an interesting way to live that more resembles a small apartment space rather than a college dorm." What is your favorite thing about Race? "My favorite thing would have to be having a common room and kitchen. It's so chill being able to stay in your own room to hang out, watch TV, and eat without having to leave. It makes you and your roommates bond more easily I think." What is your least favorite thing about Race? "You don't really know many people on your floor besides your roommates. I know my roommates and I only really talk to people from the three suites closest to us, if that." "Towers is unique because its so tall, and you often get a really nice view from your room or the common rooms on the floor. It's a nice thing to wake up to sometimes." What is your favorite thing about Towers? "My favorite thing would have to be the size of the rooms. They're small compared to home obviously, but compared to the other dorms they're pretty roomy and cozy and have enough space for anything you'd really need." What is your least favorite thing about Towers? "Having to hear people complain about living in a room with three people. It's kind of a crappy situation but it's one of those things you have to deal with and people just don't want to." The changes in the content, by including quotes and references, adds greatly to the website. It is not only informational, but helpful on a personal level as well. The only thing I might change is where you highlight/bold/etc the text (it could make the posts more organized instead of just a chunk of text), and to make sure those parts are consistent throughout the blog. I really like how you asked questions about the different dorms. 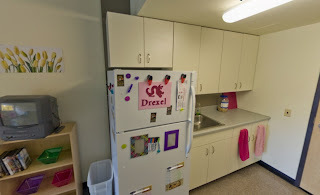 The residents there definitely give an inside perspective that isn't found on the Drexel website. The layout is very inviting and bright. I like what you have so far and would definitely suggest this to an incoming freshman or perspective student. Looks a student residence pretty awesome and very cheap as you already said. Do you know if they have someone in the apartament now?